There are a lot of ways to promote your WordPress business online. If you’re willing to invest in them, ads are one of the quickest ways to get eyes on your website. The Google AdWords platform enables you to reach the biggest audience in the world, but your chances of success are slim if you don’t know how to use it. Diving into the world of online advertising is complicated. For example, Google AdWords is easy to pick up, but hard to master. In this article, we’re going to talk about the service and teach you how to set up your first campaign. We’ll also show you three ways to make sure you get the most for your investment. Billions of people use Google products every day, with the eponymous search engine being most popular. However, you may not know that Google makes most of its money from advertising. Each time you perform a search, you’ll see ads related to the keywords you looked for. Ads can also be published on other sites that are part of the Google Display Network (such as YouTube). Because Google handles billions of searches daily, there’s plenty of money to made from including ads within results. If you want to advertise using Google, you’ll need to do it through their AdWords platform, which enables you to ‘bid’ on specific keywords. If your bid is high enough, your ad will appear when people look for those terms. In practice, the process is a bit more complicated. For example, you can pay for either ‘impressions’ or ‘clicks’. The former is often cheaper (since you aren’t guaranteed any clicks), but the latter can be much more efficient for well-optimized ads. However, there are a lot more features to unpack here on top of simple ad publishing. For example, AdWords enables you to A/B test your advertisements, track their performance using Google Analytics, cap how much money you want to spend on each campaign, and more. Mastering this functionality is key if you want to make your money count. Lets you create ad campaigns that target specific keywords, through a bidding system. Gives you the ability to publish ads throughout the entire Google Display Network. Provides performance tracking via AdWords’ built-in tools or Google Analytics. Includes split testing for your campaigns. AdWords will work out the best way to spend your budget across each month without going over. However, you can decide whether you’d like to spend it quickly each day or spread it out evenly. We usually favor the latter approach, since you get useful data on what times of day people are more receptive to your ads. Even though building an ad is simple, creating a successful one takes time. Before you spend any money, we recommend taking a look at some high-quality examples. When your ad is ready, click Done, then Save and Continue if you’re ready to push your ad live. AdWords will ask you to review your ad one final time, and if you return to your dashboard, it should be active. Congratulations, you just created your first AdWords campaign! While you can now create AdWords campaigns, there are a number of ways you can make the most out of the platform before spending a penny. Let’s start by talking about your competitors. Going into online advertising without a plan is a surefire way to blow your budget. A good base plan involves checking out what your competitors are doing, then improving on their efforts. To put it another way, long-standing online ads are usually proven income earners. AdWords enables you to take a peek at how your competitors are performing for similar keywords as you, using public information. However, you can’t just steal your competitor’s ads. You need to analyze them and figure out how to improve them. That’s where marketing experience comes in, as well as good old-fashioned split testing. One of the most common mistakes people make when they get into online advertising is to blow the budget on untested ideas. You might think you have a killer ad on your hands. However, the smart thing is to let it prove itself before you sink too much money into promoting it. Ideally, you should be making money from conversions you get via AdWords. Each conversion should more than make up the cost of each bought click, at the very least. In most cases, you’ll see conversion rates of 1-3%. This means if you’re promoting a $50 product and you have a Cost-Per-Click (CPC) of $0.25 (which is very low), every 100 clicks would cost you $25 and possibly net you anywhere between $50-150. These are, of course, back-of-the-napkin calculations.Your goal should be to spend enough money each day to get a decent amount of data, without going overboard and blowing your daily budget. However, keep in mind the average CPC across AdWords is about $1-2, so you’ll need to spend a decent amount of money if you want serious results. AdWords is a powerful tool and it comes with its own set of analytics. However, the service doesn’t tell you much about what happens after people click on your ads. That’s where Google Analytics comes in, and together, these two form a powerful duo. The main upside of using Google Analytics alongside AdWords is to set up advanced goal tracking. For this, you’ll want to make sure Google Analytics is integrated with your WordPress website. 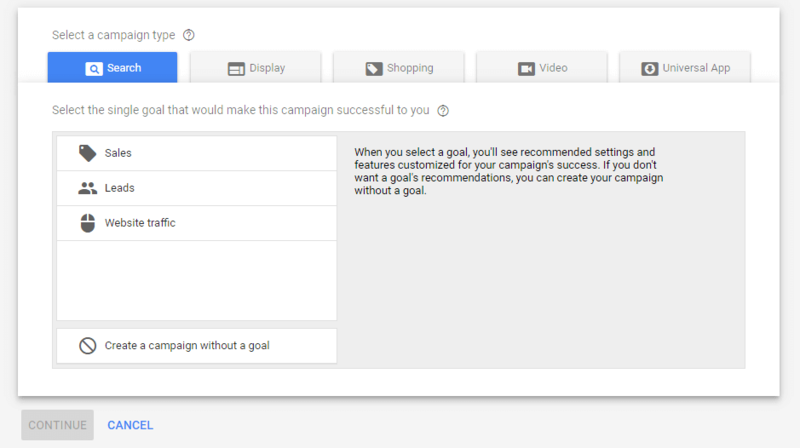 Then, you can link AdWords to Google Analytics and configure which goals you want to track. It’s a somewhat involved process, so we’ll refer you to this full tutorial, which covers it step by step. If you have the budget, online advertising is one of the most effective ways to get people to your website. With Google AdWords, you get to target what is possibly the biggest audience on the planet, so learning how to use it is definitely worth your time. Link your AdWords and Google Analytics accounts. Do you have any questions about how to use Google AdWords to promote your WordPress business? Let’s talk about them in the comments section below! Article image thumbnail by Nicescene / shutterstock.com. Wouldn’t 100 25cent clicks cost me $25? Thanks for spotting the error, we’ll make sure it’s updated right away! I’m using Adwords Express, spending $250 a month and as a pool builder the little bit of clicks/leads I am getting are working well. I don’t need a lot at this time. Now my website is currently on Concrete5 CMS and when I try to put my tracking codes in the little place where tracking codes are input the little tool does not put the codes exactly where they need to go and Google does not see them, so no analytics. That was the primary reason I am migrating to Divi. I am not a developer so I was not able to find my php file or whatever I needed to do to manually edit the head and body. Not like the DW days when I could at least edit a little html. So seeing this article assures me that I am in the right place for wanting a website with Google Analytics capability. Looking forward to getting past the early phase of learning Divi. For some reason even with all the videos it’s a bit of a struggle and the big thing is trying to figure out where WP leaves off and Divi takes over. Seems like I still have to do a lot of things thru WP dashboard which is also brand new to me. Would be nice if WP had a stripped out version without all the blog clutter. I know I will love Divi when I get it rolling and really love all the continuous new features and capability. Thank you. Nice Article. Almost resolves every issue for me.